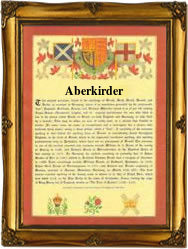 Recorded in several forms including Aberchirder, Aberkirder and even Aberkirdo, this is an ancient Scottish surname. It is locational and originates from the barony of Aberkirder in the parish of Marnoch, in the former county of Banffshire. It is one of a group of surnames which are first recorded in the year 1296 when the one and only republican government of Scotland known as the Interregnum, and later in 1306 to be overthrown by the famous Robert, the Bruce, demanded homage from all the known nobility and land owners in the country. Johan de Aberkerthe being one of those so recorded, and presumably the first of the family. Thereafter the name is well recorded and not always peacefully. For instance in 1370 it appears that a John Aberchirder took part in an attack on one John de Gairdyn, whilst later in 1390 Sir John de Abyrkerdor, so much for medieval spelling, is recorded as having resigned the chancellery of Caithness. In early records the name appears frequently with the prepositions "de" and "of" both relating to land ownership, although in common with most locational surnames in the British Isles by the year 1500 these had disappeared from the charters. As an example, in 1446 David of Aberkirdach, a follower of the earl of Huntly was slain in a battle with the followers of the earl of Crauford, outside the gates of the town of Arbroath, whilst in 1529 both Alexander Aberkirdour and Alexander Aberkirdo, appear in the records of the county of Angus.